Corn on the cob is a pretty big deal around here. Especially for Hubby. When we were first married, I remember a shocking moment of seeing Hubby eating away on a fresh, just husked, uncooked piece of corn. I am pretty sure I gasped and said something like, "uh, ew gross". He assured me that this was one of the best ways to eat fresh-off-the-farm corn on the cob. I assured him I would take his word for it. To this day, I am still taking his word on it. Just like Hubby I have fond memories of eating Summer corn...eh hem...just not without cooking it first. I remember once during a Summer living in California we were able to pick corn at a family friend's house. We went as a whole family grasping large plastic trash bags. We picked and filled those bags until we practically had to drag them to the car. My next memory of this corn picking event is the glorious bi-product. 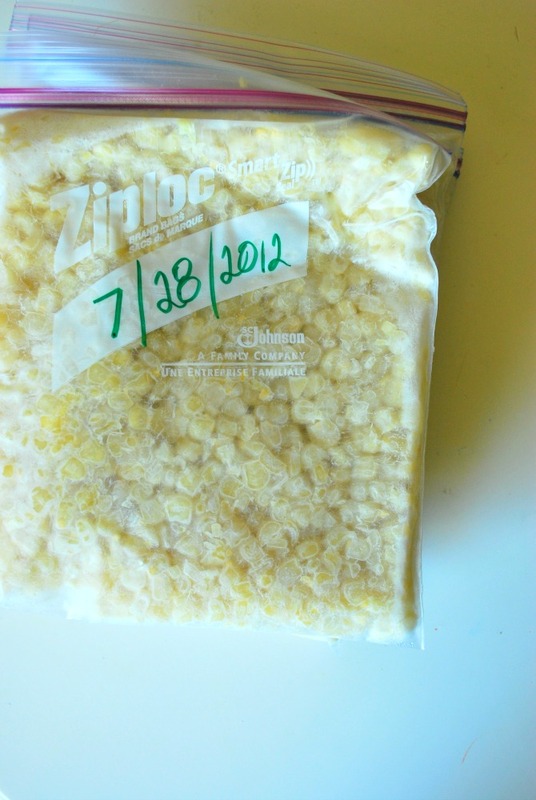 Not the cooked corn on the cob, but the freezer corn my mom made. 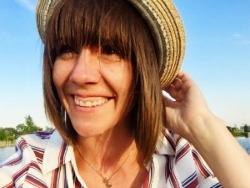 I watched her husk, de-silk, and cut off the kernels with some really scary jagged teeth contraption. Then I remember having bags full of freezer corn...I may or may not have remembered any other steps. Hence why when we had some corn early in our marriage, and I froze said corn and then tried to eat it...it was well completely nasty. My 10 year-old self didn't seem to pay really close attention to every single step. 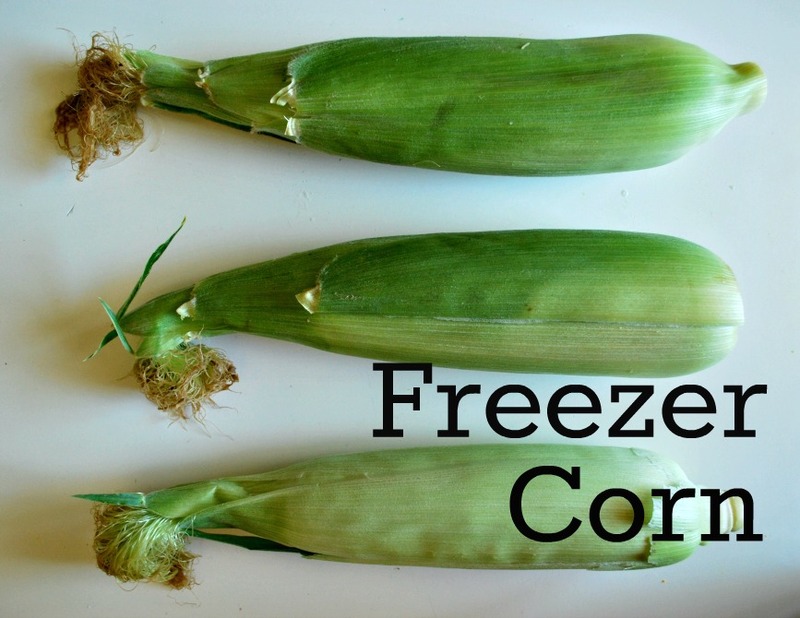 Well, now with some more decades under my belt I know how to properly freeze corn. Yeah, I am so grown up now. Do you want to make corn? Did you already know? Indulge me...pretend you didn't...hahaha. It is really simple to make your own freezer corn. So simple to make the taste of Summer corn last all year long. First, husk all your corn. Then cut the kernels away. We used a boning knife...but there are handy dandy tools that help you do it faster. 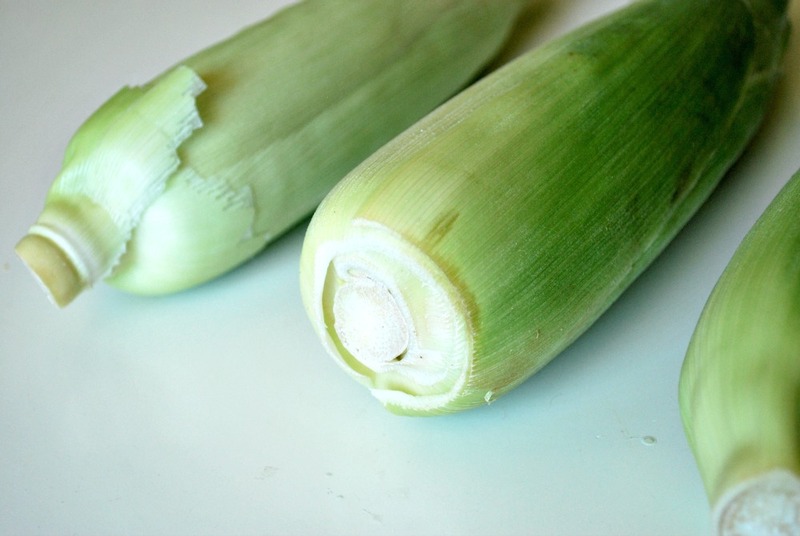 Cut as much of the kernel away as you can, do not go back and re cut a row you have already cut. That will lead to a different texture. For every 4 quarts of corn, add the corn to 3 cups of water is a large stock pot. 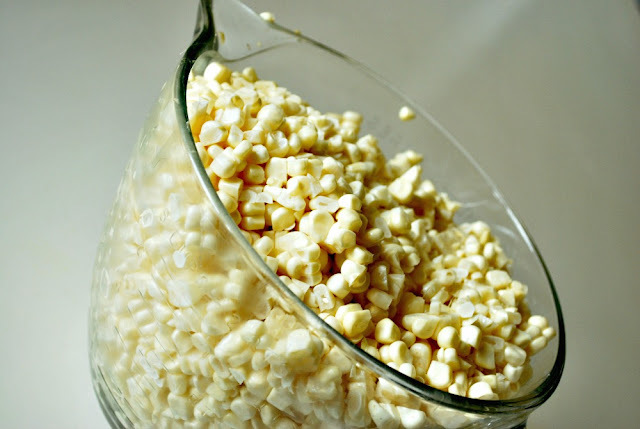 To the corn and water add 2/3 cups sugar, 2 teaspoons salt, and 6 tablespoons of butter. Once everything is in the pot, bring to a simmer, stirring occasionally. Once it is at a simmer, let it continue to simmer for 5-7 minutes, stirring frequently. 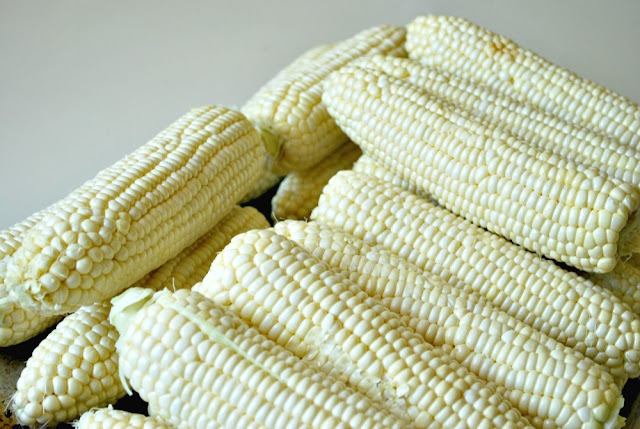 As soon as they corn is cooked, remove from heat into a large bowl. Set the bowl in an ice bath to stop the cooking process. 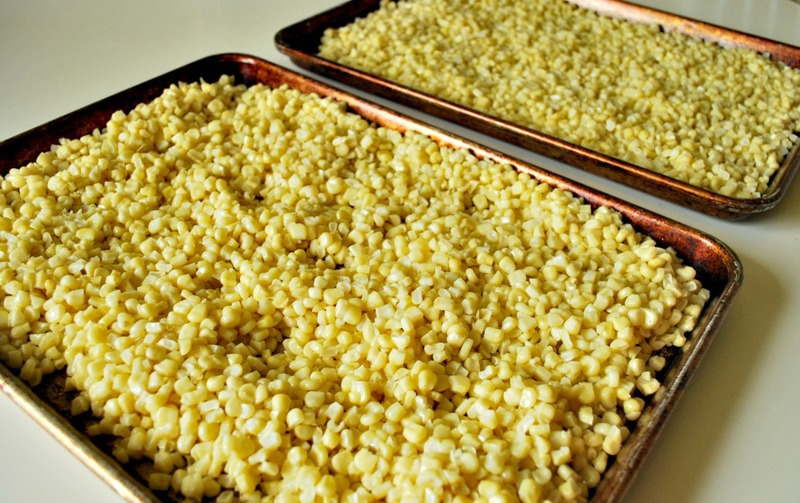 Once the corn kernels are have cooled, divide evenly on cooking sheets. Spread the corn out so that it is in a single layer. 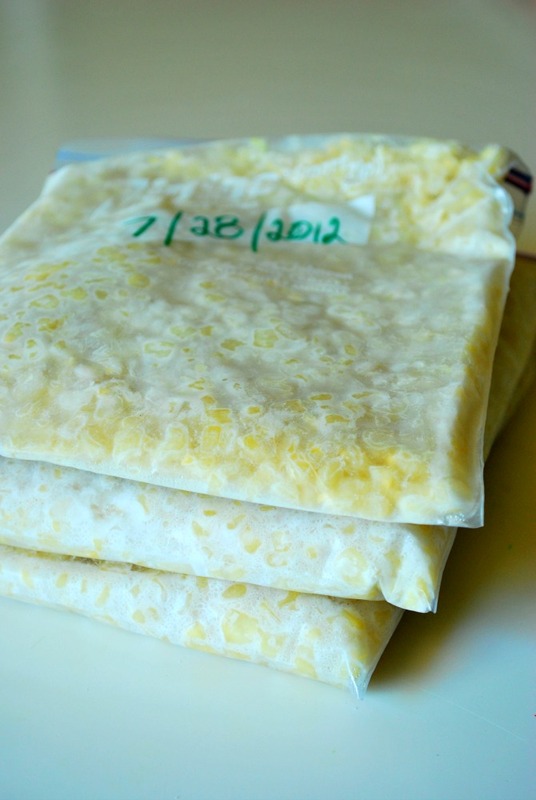 Once the kernels are frozen, store in freezer safe bags. We stored some of the corn in large gallon bags for adding to recipes. Then we also stored some in smaller bags that could be heated up for a side dish to a meal. 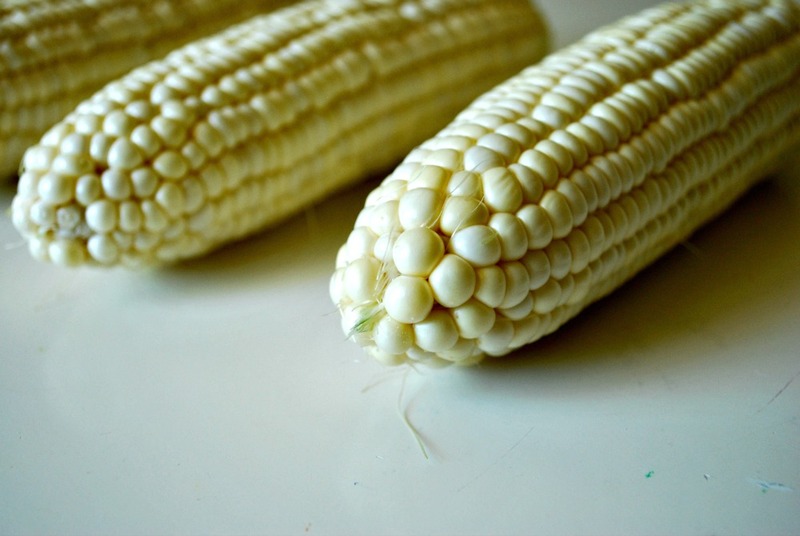 Now we have the glorious taste of Summer corn whenever we want it. have you tried baking it in the oven in the husk? 30 min at 350, in the husk and all. awesome! Where nave you found good corn yet?? We seem to keep getting the not so ready yet kind! Help a sister out! We are corn obsessed too :)...we like to leave it in the husk and put it directly on the grill EVERYTIME we are BBQing, because then no one (meaning me) has to stand in the kitchen and cook side dishes while everyone else is outside enjoying the sun and grill. Have you tried grilled corn? So delicious! !